Ferguson is trying to help his grandfather figure out his legacy. His grandfather doesn't want to have any regrets, like his old friend McDermit, who famously caught a giant lobster but regretted not returning it to sea. So when another giant lobster is caught in their fishing community and put up for auction, Ferguson cooks up a plan with his grandfather to bid on the lobster and set it free. Will this be his grandfather's legacy or will the town's richest man ruin everything? 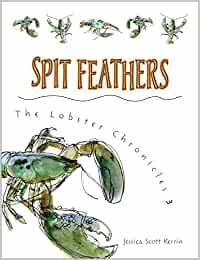 Spit Feathers is the third book in The Lobster Chronicles, a trilogy about how life changes for three boys in a small coastal town when a giant lobster is caught. Each book describes the same events through a different boy's eyes, making for three suspenseful, believable stories and an engrossing reading experience. Jessica Scott Kerrin is the author of the bestselling Martin Bridge series, inspired by the misadventures of her husband and son. Her first novel, Martin Bridge: Ready for Takeoff! was named an ALA Notable Children's Book and placed on the Horn Book Fanfare List. Kerrin grew up on the Canadian prairies, but now lives with her family and pet tortoise in Halifax, Nova Scotia. The Amazon and jacket cover description of this book is fine as far as it goes, but falls short of describing all of the true delights of this book. On one level it is about a scheme to buy a giant, ancient lobster at auction and then release it back into the wild. But what leads up to that is beautifully written and touches upon a number of themes potentially of interest to middle graders. Ferguson is our narrator. An only son with eight sisters, he spends a lot of time with his grandfather who lives at a retirement community called Sunset Manor. Granddad was a top lobsterman in his day and can still spin a fascinating sea yarn. But, Granddad is haunted by the fact that he has no "legacy" to leave behind, like some of his fellow lobstermen. There is no singular achievement or accomplishment that is just his. And so, Ferguson, too, becomes obsessed with the task of creating this "legacy". MILD SPOILER. You can see where this is headed, with the ancient lobster being bought and then released by the ancient lobstermen of Sunset Manor. And their rallying cry, "Something that's survived so long deserves to be set free! ", underlines that connection. The book ends with a suspense filled auction. All of that said, this book also has a number of quiet pleasures that turn on the quality of the writing. It opens with a deadpan funny funeral for a dead bird that establishes Ferguson as a thoughtful romantic in that disorganized slightly manic middle grade way. His friends are deftly sketched in and there are at least a dozen fellow students who have distinct and memorable bit parts in the story. Ferguson's interactions with various sisters are affectionate and there is no phony or discordant sibling rivalry thrown in for added drama. (There is a funny running joke that everything that Ferguson owns is hidden somewhere in the house because his sisters will otherwise make use of the items, since they have no respect for his privacy. That's what I mean by graceful touches of wit that elevate the book.) Ferguson's Mom is a wedding dress seamstress, so he always has to wash his hands before he comes into her work room to talk to her. Again, a nice touch. And the book is filled with little bits of business like this, or wry or awkward observations, or surprising insights - all of which reward the reader with much more than one usually expects from a middle grade fiction of this sort. This is book three of the Lobster Chronicles. The other two cover exactly the same events, but are written from the points of view of two other characters who are important to the story. That Rashomon approach may work, (although the story is a little slim for such treatment), but if I had to choose I'd pick this, Ferguson's, version just because he is such an engaging narrator. So, if you'd like a well written book with a decent story and some very charming and graceful notes, this might be an attractive choice.